Phottix’s flagship Odin II TTL Flash Triggering system has expanded to include a new transmitter control unit (TCU) compatible with Pentax cameras. The Odin II for Pentax enables us to take our 645Z from the studio to on-location! Even in full sun, the Odin II’s HSS support allows us to Take control of ambient light and get amazing results from our 645Z and Indra 500 combo! Phottix’s flagship Odin II TTL Flash Triggering system has expanded to include a new transmitter control unit (TCU) compatible with Pentax cameras. Developed with direct cooperation from Pentax engineers at Ricoh Imaging in Japan, the Phottix Odin II for Pentax brings the power, control, and ease of use of the Phottix TTL lighting ecosystem to Pentax users. Tested extensively with the Pentax 645Z Medium Format DSLR Camera and the ground-breaking Pentax K-1 DSLR, the Phottix Odin II gives Pentax users more creative control over their art. The Phottix Lighting Ecosystem System offers solutions for every photographer, from lighting minimalists to studio professionals. With the Odin II for Pentax, users can trigger and control the power level of the Indra 500TTL Battery Powered Studio Light in both TTL and Manual modes as well as adjust the modeling lamp all from the top of their camera. Also compatible are the newly introduced Juno Manual Speedlight and receivers from the Phottix Odin, Strato II, Atlas II and Ares II flash trigger systems. The Odin II allows Pentax users the ability to use High Speed Sync and shoot at speeds of up to 1/8000s on compatible cameras. When paired with the Phottix Indra500 TTL, shutter speeds are no longer a limitation. The Odin II for Pentax user interface was built off feedback from photographers across the globe. Features such as individual buttons for each group – A, B, C, D, E, and an analog thumbwheel give users quick and direct access to their strobes from the top of their camera when they need it most. The Odin II features 32 channels as well as a Digital ID function to completely eliminate interference and outside triggering. 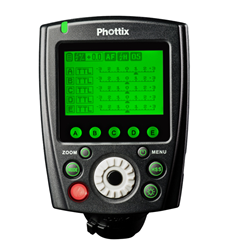 Digital ID is a four digit code that secures the connection between compatible Phottix products and will only allow triggering signals from products using the same four-digit Digital ID code. Now there is far less to worry about when shooting in crowded situations like sporting events or concerts. The Odin II for Pentax retails for $139.95 and is available for preorder now at major retailers and will start shipping to customers in April. For review and marketing opportunities within the US please contact Jeff Lazell, Phottix’s Brand Marketing Manager at their US Distributer MAC Group.